Auckland Transport have announced the outcome of their annual review of public transport fares with the changes coming in to effect from Sunday 11 February. AT are clearly into recycling as one thing I noticed is that the fares being changed, the amounts they’re being changed by and even the press release are all almost identical to the 2017 changes. That is in that the changes target the shorter 1 & 2 zone trips as well as the 4 zone trips whilst dropping prices on the medium distance, 3 zone fare. The major exception to this is that apart from some ferry fares, the changes this time are all to the HOP prices. Almost 90% of bus and train trips are on HOP so the majority of people will be effected in some way. Bus, train and ferry fares will be changing from 11 February 2018. Auckland Transport reviews fares annually to ensure they keep pace with operating costs and the portion of costs recovered from fares. Colin Homan, Group Manager, AT Development says Auckland Transport has a target to recover 50 percent of the cost of public transport from fares, but this is currently at 46.2 percent, with the balance subsidised by ratepayers and taxpayers. In the year to the end of December, 91.1 million trips were taken on public transport in Auckland, an increase of 7.4 percent on the year before. The changes for bus and train fares include increases to 1-zone, 2-zone, 4-zone and 5-zone fares of between 5c and 15c and there will be decreases to 3-zone fares of 5c for adults and 8c for children. There will also be increases of 7c to 10c for tertiary fares to ensure concession consistency across zones. The table below shows the changes for the bus and train fares. A quick calculation suggests that for people that use PT for their commute all year, the 1, 2 and 4 zone increases will result in paying about $23-$69 more annually. As has been pointed out numerous times, including by Stu last week, PT fares in Auckland are very expensive compared to many other cities. These changes will do nothing to improve that situation. While the farebox targets do have something to do with it, AT has focused fares on competing primarily for individual commuters who would otherwise drive and have to pay for parking. This makes PT expensive for non-peak trips or for travelling in groups. Raising fares is never good for encouraging more people to use PT. However, I do accept the need to adjust them from time to time and at least the changes for the most part aren’t too severe. But I do wonder about the timing of the changes being right as we’re heading into the busiest time of the year. February and March are some of the busiest months of the year for PT use. They’re also busy times on the road and when AT are quite likely to get new customers trying services. Exactly the wrong time to have headlines about fares changing. Perhaps AT need to shift future changes to the middle of the year to get around this or perhaps even make the changes on New Year’s day, like Melbourne does (the changes would need to be announced in early December). What’s driving the cost increases? Ridership has been increasing strongly over the last year. As AT note, PT is up 7.4% on a year earlier and yet the farebox rate has still declined. That suggests costs have been increasing at a faster rate. Some of this will likely relate to the roll out of the new network but AT really should be clearer about what’s driving the changes. Over time as AT consulted and then started rolling out the new bus network, we saw them continue to move away from the core principles behind the network in response to feedback/complaints. This has led them to retaining some expensive to operate services, such as peak only express buses. Some numbers that we’ve received from AT show that many of these have very low utilisation. That’s resource that could instead have gone to ensure that the rest of the new network could roll out properly. On a related note, they’re also wasting money on things such as the silly Devonport shuttle trial when basics such as all day rail frequencies, continue to be ignored. AT need to look at how to refocus on how to get a frequent, reliable PT network established before getting distracted on the next tech idea and/or fad. Is it time to rethink Farebox targets? One of the main reasons AT give for these changes is to help get the farebox recovery ratio, the amount of costs covered by fares, over 50%. The farebox rate did briefly get over 50% in mid-2016 before simplified fares rolled out and has been in decline since then. This has mainly been driven by a reduction in bus recovery rates, some of which will be due to the impementation of the new network. As you can see in the graph below, rail has been improving quite a bit over the last few years following the impressive growth that’s been seen, although that’s starting to slow down now. While there’s not much that can be done to affect this round of changes, we think that the new government need to take a look at how PT is funded. The 50% farebox target was an arbitrary number from the previous government that had no assessment behind it. Whilst it sounds good in theory, it’s a really blunt instrument that is likely meaning we’re not extracting the most value out of our PT system. For example, a lower recovery rate might mean we can improve services and encourage enough additional people to use PT that it more than makes up for the extra cost to tax/ratepayers overall. We think that there could a valid case for the government to increase their contribution, thereby lowering the farebox rate, to ensure that AT can not only roll out the new network but also that it has enough frequency to be successful and gain ridership. This includes ensuring that rail has all day frequent services so it can act as the backbone of the PT network as planned. Will the change in fares affect you’re PT usage? I’m fortunate enough to be within 1 zone for my work commute, so the 5c increase won’t be noticed. My commute is two zone so maximum effect. $1.50 per week if I were to bus every day. Being summer I can bike two or three days a week, and having a baby boy at home and an overworked wife running after him, I drive two or three times a week, and being against the flow, driving costs me no more dollars than the bus (because like most people I forget parking, maintenance and registration costs when comparing), but my soul is destroyed by such antisocial behaviour. However my dear wife has won this argument. I don’t think raising fares is a good move, as you say the farebox recovery number is based on nothing, so if that is the principal justification, AT doesn’t have a good case. Previously they have targeted the cash fares, which I understood as the HOP system increases efficiency particularly on buses, but AT obviously now consider HOP card usage to be high enough. Looking at the new numbers, the first zone costs $1.90, the second $1.40, the third $1.50 and the forth $1.40. They appear to be taking the 50c transfer discount very seriously! There is no 50c transfer discount. Transfers are free. Matthew – with a young child I got an e-bike for this reason (ability to be home quickly at the end of the day). That sounds nice, not really affordable at the moment for my family unfortunately. How much faster do you go? I can do about 15kmh average by pedal. Yes, they’re still expensive unfortunately. I live up a hill ~ 6km from work. It’s 10 minutes there (36 kph) and 15 minutes back (24 kph). Faster than a car if there’s any traffic. Shaved 10 minutes off my commute home compared with a push-bike which made a big difference in getting me home ASAP to the family. That sounds very cool. I am CBD to New Lynn, 45 minutes going for it. Pretty flat so I could probably double my speed with some electric juice, and that would make it comparable with the car. I have seen a few electric wheels that fit onto any bike but hard to track any in the country, they could be a more achievable option. Thanks for the insight! There is a bike shop near me (Christchurch, unhelpfully) which can turn most types of bike into an electric bike. They take out the crankset and bottom bracket and fit a motor in there. Cost is ~$1800. I’m sure you could find a shop in AKL to do the same. Ebikes are only expensive compared to an ordinary bike. Even the flashiest ones are cheap compared to a car, even more so when insurance, running costs, etc, are taken into account… and even good ones in the $2-4k range are well competitive with a couple of years of Transit fares… all things being equal. One of the main reasons I ride is because my Transit options are so slow and infrequent, Grey Lynn being in something of a Transit shadow. I have yet to e-bike in part because the exercise is good… but I will go there soon when I find one I love, then I will ride further, displacing more driving. Hm normally riding a bicycle will be much more flexible and usually faster than catching a bus. The problem is that a car is usually not an optional item in the budget, and bicycles are. And I think you underestimate the cost of the flashy ones, these cost enough money to run a car for a couple of years. 4.76% rise in the 2 zone hop fare seems high, it’s well over double the 1.9% inflation rate. I think this is a really good point. Why are the proportional increases different to one another? If they carry on hiking certain journey-lengths over others in the future, won’t we get to a point where a 2-zone is not that different to a 3-zone trip? I presume the targeting is to try an extract a required amount of money from the exercise but why penalise some trips more than others? What a royal rip-off for ferry users! A 1-zone fare into the CBD is now $1.90 from the south, $1.90 from the east, and $1.90 from the west. But the same trip from the north has gone up to $4.80. Talk about the world’s most expensive public transport! This has gone on too long, and intervention from our mayor, our councillors and maybe our government is overdue. AT cannot be permitted to carry on like this. No more excuses, but action for once. And please, no more blaming Steve Joyce – he is gone and his legislation allowed for fare equality anyway as AT well knows. 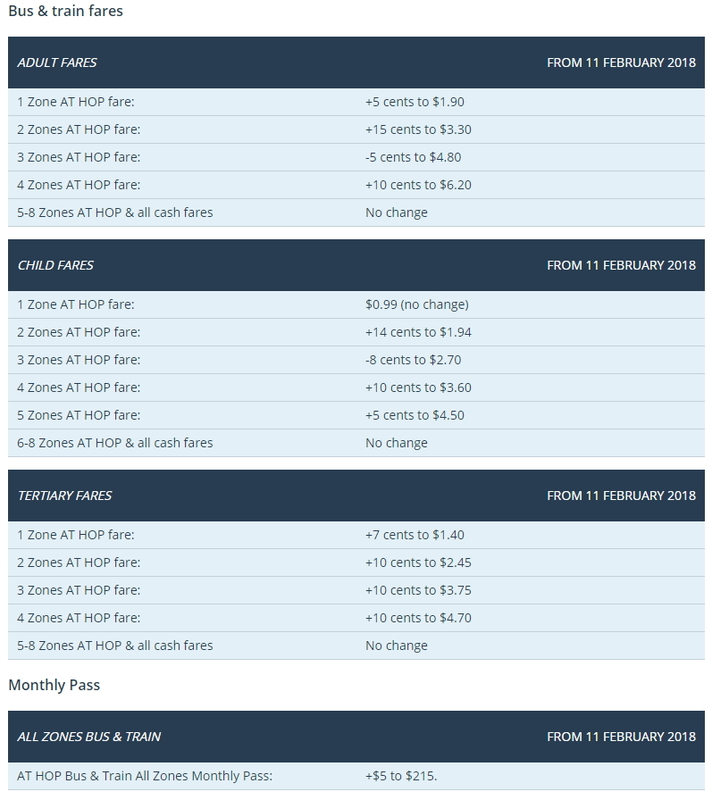 To me these fare changes for 11 February should not go ahead – instead something fair should be put in. Yeah should just be a regular two zone fare across the harbour. I wouldn’t complain too much about fairness though. You always have the option of catching a bus like the rest of us, at the same price. But most of us don’t have the option of a ferry! You might well think that Nick, but that option requires 3 buses and an 80-90 minute trip with half-hour gaps between services. Another good deal from AT! So largely the same amount of time as a bus from West Auckland? Ah, but most of you get the option of riding your bike without having to pay for the privilege of sticking it on a ferry for part of your journey! Why do ferry fares get so much less subsidy? If they were at this lower price/higher subsidy level, particularly the short trips from the North Shore, would it take more pressure off the bridge? It’s an averaging thing. Because the clear majority of ferry passengers are on the Devonport and Waiheke runs which are currently commercial services without any subsidy. So that raises the average bigly. But if you look at all the other ferry lines separately, they are subsidised much more than average across the network. Eventually they’ll manage to extract from those commercial contracts and start using the two main routes to cross subsidise the others to some extent, but that will lead to worse, if fairer, funding overall. I think that the point is that AT should commit to a mode-neutral fare system and then work steadily toward that. It should not matter that Devonport and Waiheke are outside AT’s control and are unsubsidised – AT should start with the services it does control and shame Fullers into following suit. Better still Devonport and Waiheke should be brought under PTOM. If I was an inner North Shore resident I’d be complaining loudly about equity. I asked at AT once why this anomaly existed and was allowed to continue and was told that if fares were standardised too many people would use the ferries and significant capital investment would be required. What a terrible problem! Perhaps they’re also worried it might take the pressure off Lake Road at peak hours? AT’s comms team are so useless. They could just say ‘the government will not allow us to operate that route’. 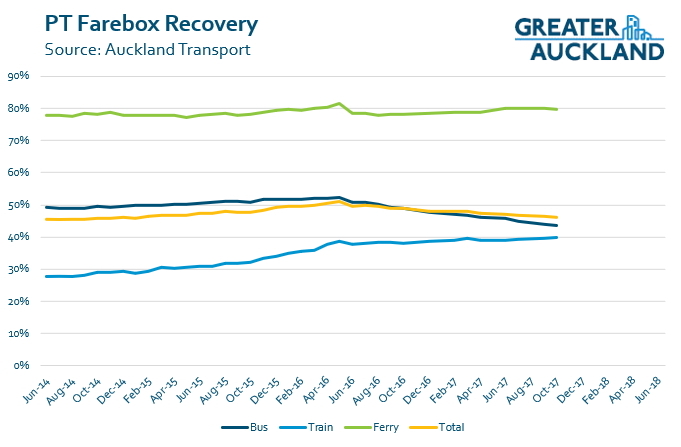 One of the reasons the farebox recovery is so good for ferries is the amount of off peak utilisation, through visitors using the Devonport and Waiheke ferries and also some of the peak vessels being used for cruises during the day. If fares were to be reduced it the growth would likely be mostly on peak services. Buying more ferries just to run peak services will be very expensive and along with the reduction in fares would likely see farebox recovery fall dramatically, possibly below trains and buses. It’s all money that can’t be spent elsewhere. I think integration should happen immediately, but it’s worth noting that even in Sydney where there is integration, there is a premium on the Manly ferry for example. Some services simply offer such a large advantage over other options that they should pay a premium for the costs of operation. We’re not planning of bringing flights to Great Barrier Island into integrated ticketing. Wow, that is complete incompetence, and if this represents AT’s attitude then why is our council so silent? Honestly – they don’t want to invest because there is so much demand for public transport services? Change is needed and when I voted in local and national elections I hoped I would be getting it. Surely in the medium term the Devonport ferry ought to become a “frequent” route – I’m sure I’ve seen something to that effect. In which case additional capacity (and therefore additional capital investment) will be needed anyway. Even if the majority of the new traffic is at peak times there’s no philosophical difference between buying new ferries to support peak hour ferry commuters and buying new trains or buses for peak hour use. Given that the biggest problems with Lake Road are at peak hours, the potential capital savings achieved by needing less work in this corridor should be set toward the capital investment in new ferries. Hi jezza, the Manly ferry is a 9.5km trip, about four times further than the Devonport ferry. A trip to Manly costs about $6, so divide that by four and you get $1.50, which is not too far off the $1.90 that AT charges it’s bus and train users. Equality is needed, let’s do this. Britomart to Devonport is 2.74km. This is almost exactly the same as Darling Point. Circular Quay to Darling point is AU$5.88: that’s NZ$6.44 Circular Quay to Balmain is 2.4km, also AU$5.88. Circular Quay to Manly is AU$7.35 or NZ$8.04. If you want fares aligned with Sydney then you will get $6.50 each way on the inner harbor and $8 each way on the outer harbour. The Manly ferry is also exempt from the Opal fare cap. Even if you have hit the cap for the day you will pay for the ferry trip. Just asking for equality – the same fares that bus and rail users are charged. No more, no less. We are part of Auckland too, and the council and our mayor need to recognise that. Equality is relative. If it costs twice as much per passenger to provide a ferry service that takes half the time of the bus then I think it is quite reasonable to charge a premium for that service. I doubt the cost difference is as dramatic as that example but I’m sure their is a cost difference, boats are expensive to buy and burn a lot of fuel. I agree with you that we should aim for equality. I don’t agree with you regarding what it looks like. Lets bring ferries under PTOM and charge a fare that, over the next ten years will lead to a 50% recovery rate (or whichever rate we choose). I think this will result in a reduction in ferry fares, but still higher than buses for the equivalent journey. I have never seen an Auckland budget or annual report. Where can I get one? It will show incomes and expenditure for all departments. The costs of home watertight issues, amount spent on transport etc. Is the council cutting back in some areas in order to pay for the big projects. What total rates are collected. It would be interesting, democratic and transparent to see their projections and priorities. ATs website might be a good place to start. As a one zoner (Ponsonby end of K’rd) tired of being stuck with all the increases over the years (remember the inner city zone?) and forced to use the godforsaken Links for lack of any alternatives, hit with zone boundaries to go 5 minutes in any direction and a 15 minute walk to any useful route, Buses are no more an aspect of my life. I cycle towards the city and drive away from it. True, but if you’re going all the way to downtown, it is a fairly long walk. And for getting out of the CBD: same experience for me — to do that in any reasonable amount of time you need a car. I work either wynyard quarter or britomart – no buses and ~20-35 minute walks, bus no quicker, or much slower with added walking and reliability issues (remember, Link buses – midtown buses aren’t worth the hassle). That’s a problem as when I have to be in Albany and can get there in 20 minutes by car – something wrong there. +1, we desperately need more bus lanes around the inner city and to make a lot more of them 24/7. Ponsonby Road, Jervois Road are obvious examples that would help you. Plus Queen St should just be closed to cars already! That is not the biggest problem. There’s just not a proper network in the inner city. It’s a bunch of suburban buses doing some random loop each to drop off and pick up commuters. As a consequence, even the simplest journey will take forever. I was a bit further north on Hobson Street, and a round-trip from there to Newmarket would have taken me 2 hours on PT. (while it took about 40 minutes by car). Wynyard Quarter is unreachable by bus. Eh? Wynyard Quarter has a Frequent Route (City Link) and a bus to Ponsonby (Route 010). But the 010 is not going to the CBD (it’s going towards Ponsonby — duh), and the City Link is not reliable and very slow. Oh well. I complained about it to AT during the Central New Network consultation. But that consultation really was about the inner suburbs, not about the city centre. Sometimes the CBD was just an opaque box. Other times you’d see the buses coming from one particular corner of Auckland. TBH my impression is that those apartments in the CBD have been classified as riff-raff and left behind. My advice is to move out as soon as you can afford it. It’s not crazy hard, we just need to stop treating the CBD as a commuter (close enough) termination point. All buses should proceed THROUGH the CBD and connect with at least one other major route at a big interchange. • Wellesley Street busway — not sure if that’s possible at all with the CRL works. But it would solve quite a few problems with getting around on PT within central Auckland. • There’s a big parking lot on Wynyard Quarter. Convert some of it to layover space for buses. • Terminate the Blue Link on Wynyard Quarter. That’s quite fitting for a line along our more fancy waterfront, and one line less which starts in those little lanes behind Customs Street. • Terminate at least one bus line along Wellesley Street on Wynyard Quarter, so it will intersect with most buses coming from the North Shore. Now the red city link is redundant. But if we like L-shaped bus lines, we can keep it anyway. • Figure out the fastest route to get a bus from mid-town (or Victoria Park) to Newmarket. Which I think is along Wellesley Street. Make sure at least one line follows that route. The amount of time it currently takes go get from the Sky tower to a train in Newmarket is just weird. • Similar issue for Kingsland. There’s trains to the west there. What about Bond Street — Karangahape Road, and then perhaps Albert Street? It was already cheaper for me to drive, I may use this option more often. As a note I do own a car for work (when doing site visits with work gear) and pleasure purposes (towing a boat, mountain biking, skiing etc) so cost of owning a vehicle and insurance is non factor for myself. (I’m only including maintenance, fuel and limited times I have to pay for parking as costs). I wouldn’t mind raising individual fares so much if there were some fare incentives included. By fare incentives, I’m talking fare caps for weekly / weekend / monthly travel. You know to incentive commuters to leave their cars at home, and make travel affordable for those who need it, without having to think about pre-purchasing monthly passes. Seems like a missed opportunity to increase cash fares again to drive another 2-3% improvement in HOP card usage. I do wonder about which regions have the highest cash usage and how this could be encouraged to change further by AT – some innovation required, but has been done in many cities. NEX needs to be cashless ASAP. Sell tickets at the stations if they like and driver can just check those. I’ve noticed that in Sydney, and the problem is always where to buy those tickets. You may be a few kilometres away from the nearest place. Maybe that place is closed today. So in practice as a visitor you can’t catch those main lines. This in turn renders Google Maps and other journey planners useless, because they will usually propose trips involving at least one of these lines because they are, well, the main corridors. This makes the bus network very hostile to visitors, and I assume anyone who doesn’t already regularly take the bus. Have an app you can download (instructions at bus stop), purchase a single ticket on the app. Simple. We really need to make better use of modern technology these days. I like the Melbourne solution to have the top up machines also be able to sell the cards. The gap between cash fares and card fares is already significant. Any increase to this is a further barrier to occasional users, who may not have easy access to somewhere to buy a a card. These people are inconsequential in overall revenue, but they are an important conduit between those of us who use PT frequently and those that never use it at all. These people may use it twice a year when they have been out for drinks for example, they will likely tell other non-users what they think of their experience, we want it to be good. Brisbane does that too (the destination board is marked with a “P” to make it clear), though I suspect it’s for the purposes of decreasing the latency on the route in the hope of not needing more buses. Not really — in the city the NEX just stops on regular bus stops, and soon on three different routes. What a startling lack of imagination to write it off on this basis. Here is a simple set of instruction to remove 99% of the delays incurred by cash ticket sales. Install ticket machines at stations on the shore. Install ticket machine at 2 CBD stops on NX1, 3 CBD stops on NX2, and one shared CBD stop. Put up signs at stop ‘Prepurchased tickets only for NEX services at this stop’ at all of the stations listed above. Do not install the signs at Ponsonby Road stops. Only people on the NX3, on the isthmus will be held up by cash sales. I agree that the express buses need to go. Most are in catchment areas very close to rail or the NEX. Presume a lot would be under used now due to motorway congestion (& reliability of time), but handy to have during a train strike or disruption? For the southern area they are a good one seat ride to the city Universities if going in early…hmmm perhaps that’s the reason – students would go in later generally. Yes there are some advantages to express buses (better than rail replacement buses and no need to change buses). Maybe those routes should be less express and more just a long route. In London with their huge and pretty comprehensive rail network they still have a lot of long bus routes that can take you most of the way across the city (the equivalent of say Browns Bay to Onehunga, or Henderson to Pakuranga, or downtown to Manukau). Yes they shouldn’t duplicate trains unnecessarily but there certainly are times where buses are more convenient for people (typically closer to their homes and destinations) and as much as I love rail, it is quite expensive to build and run for all but the busiest routes. Because our rail network is quite limited (basically 3.5 lines) it does mean that often any fault can shut down most of the rail network and we just don’t have other rail alternatives…. in my London example if a line or two are shut it doesn’t really matter as there are usually 2 other rail options that go nearby to where you are going most of the time – so they have even less incentive to have cross-town buses and yet they have plenty of them…. Unfortunately quite a lot of people still object to having to transfer from a feeder bus to a train – some bus stops and platforms provide little shelter. Panmure Station and its adjacent bus stop are apparently pretty bad which is why Howick/East Auckland areas users objected to the loss of their express buses. Looking at the number of people that transferred at Panmure even before the new network I think those people you describe must be in the minority. There is still an express service from Howick, however a significant number of people get off this bus and transfer to the train at Panmure, simply because it offers a superior service. I was wondering that too, if a transfer would mean a slower journey or not. The answer, at least in case of Howick to CBD, seems to be no. For the east coast bays it’s going to be a toss-up, since the express buses also follow the busway. Transferring will very likely be slower, but you get a more regular service. “”to recover 50 percent of the cost of public transport from fares”” Why? Ask every driver obliged to sit in congestion everyday – I am sure they would be happy to put more of their taxes into PT. The goldcard is magic – keeps crazy drivers like myself off the roads. But it is wrong to be charging kids when pensioners go free. The price rises for children are irrational – have our transport planners ever seen the number of vehicles picking up kids from our schools about 3pm? Daily instant flash mob. I wonder whether the Hop card system could be made route specific. So a school child’s card would allow for them to travel on a specific bus or buses to and from a school for free. All other trips would be charged for. This would give parents some piece of mind that their little darling wouldn’t be joy riding all over the town. Couple this with cell phone so the child’s movement can be tracked.should be enough security for even the most anxious parent. Any way it could keep a few cars off the road and help fill up some of the buses. Our parents didn’t worry where we were going on our bikes and I don’t think the previous generation would be too concerned either. What is wrong with children going where they want? Would you prefer for them to be hooked in to First Person Shooter games on the computer at home? I don’t think we should actually be afraid of giving our children access to the city after having denied it through car dependency. If they use it unwisely, maybe it will highlight what other work we need to do raise engaged and interested youth, who feel they have a place in their city and a stake in how it is planned. It has to get cheaper, as a 4 zone monthly pass commuter I spend $2520 a year on transport. I’m constantly looking for a cheaper alternative and right now it’s neck and neck between using my vehicle or PT. I do hope that AT realise the public at large are looking for a cost effective means to travel, if it’s too close to using your own vehicle, coupled with getting straight home faster. You can see what can happen. Also, ferry costs are ridiculously expensive. This should be on par with bus costs. Make it cheaper and more will use it, thus making up for the reduced price. Why don’t they give that a trial? The real saving is when you can get rid of the car and rely on Public Transport. Possibly in some places but not others. Kids both use PT to get to/from school, both 2 stage due to boundary location. This is a convenience thing and was always more expensive but possibly now just not worth it, and we’ll just drive a little out of the way to drop off/pick up. “you’re PT usage” obviously didn’t get picked up in a proof read. Looks like it did get picked up by the proof reader, just a pity the service you provide is so tardy and you’ve only picked it up mid-afternoon. The farebox recovery encourages operators to run efficient. If the service is mostly funded by government, the operator would have no skin in the game and become inefficient bureaucrats. The worry is if we change farebox recovery to 40%, we may find in a few years time we will need to change to 30%, 20%, 10%, eventually become fully tax payers funded. I would prefer the operators to be efficient by reducing dwell time and speed. Cut some unnecessary staffs, use double deckers, invest in efficient vehicles, automations etc. If we do want to assist, more capitial investment should be funded by taxpayers, such as improvment to ETCs to fix dwell time and line speed, closing level crossing, buying efficient double deckers bus, invest in automation, etc. The subsidies should be based on patronage numbers. That will give incentive for operators to increase patronage by increasing off peak frequency. …or to just focus on peak runs which have the highest patronage and not even bother running off-peak services. Operators aren’t paid subsidies. Operators are paid a fixed sum to operate the route with penalties and rewards for timeliness, cleanliness, etc. Subsidies and fares are paid to AT to fund the services. If you want to see why allowing operators to pick frequency, span, and routes is a terrible idea I’d suggest reading about the disastrous privatization of buses in Manchester. Absolutely agree that public transport is too expensive in Auckland. The very strong message that I receive from these price increases is AT are saying, “we have absolutely no confidence that we can grow revenue by increased patronage to cover our increased costs and so we are increasing prices.” I am not at all surprised because despite all the rhetoric in their Statement of Intent it is business as usual; the same old, same old; Auckland will stumble along with increased congestion until the CRL is complete. By then that project will be too little, too late. Marvelous! 100% agree with this Taka. Where is the strategic intent and long term priorities? 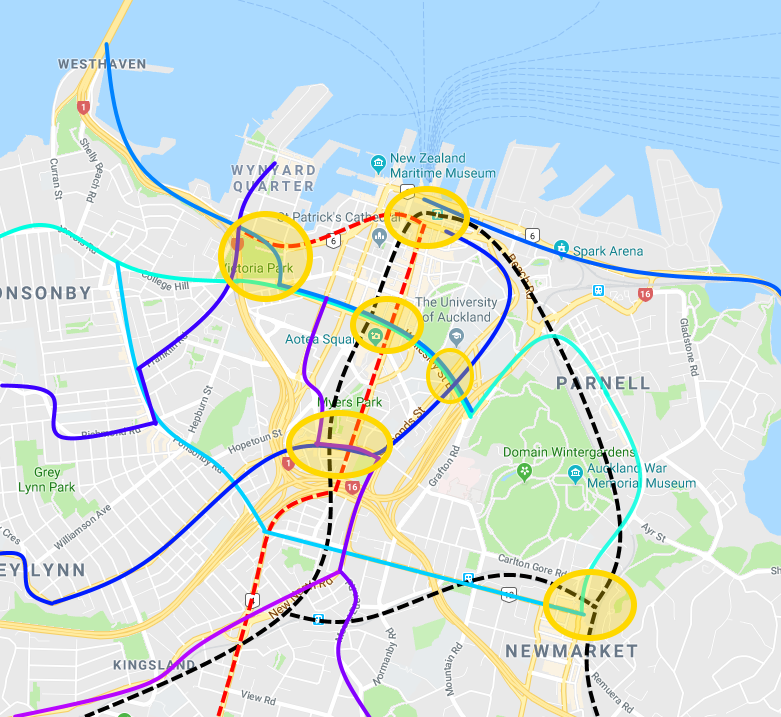 We’re building only two new light rail lines, both close to where rail already exists (to the south and west of Auckland) while ignoring the other half of the city, so CO2 emissions are clearly not a priority., For example AT is pushing for a T3 lane on Onewa Rd to serve the high density areas of Northcote, Birkenhead and Glenfield, yet no thought is given to building LRT stations for these massive centres to enable mobility and reduce traffic. It’s the same to the east of the city with Highland Park, Pakuranga and Howick. We are reluctant to reduce speed limits anywhere, not even in town centres, so safety isn’t a priority either. We randomly impose $4.80 fares for 8 million one-zone ferry trips a year so congestion and equity aren’t priorities either. So where the heck are AT’s strategic priorities? AT is potentially a huge and marvellous asset, with many talented staff, yet our aloof mayor and silent council give them no strategic direction on equity, on carbon emissions, on safety, or even on the obvious need to deliver universal access to frequent public transport. The only possible outcome is therefore this depressing maintenance of the status quo. If UberPOOL gains popularity in Auckland , AT may face some further funding problems. UberX currently can be cheaper than mass public transport, if two people are travelling a similar route. I really WANT to take public transport, but it’s a bad decision. The funding model is broken. Either roads are too cheap to drive on, or fares are too expensive.Is our PT funding resource being spent on supporting the large number of empty buses circulating the suburbs off-peak? Are commuters on profitable routes (the ones that, if successful, will reduce gridlock) being treated like a cash cow? Should ‘uneconomical’ routes be better replaced by UberPool instead of a bus? Or we regulate taxis like they do in Singapore. So many questions for the CEO of AT. If you are more than 2km from Onewa Road, you must be in Chatswood. Have you considered the 971? P.S. I realise this doesn’t address any of your other concerns, but it might allow you to catch PT! AK-Sam must be towards Birkenhead Point, if he takes the ferry. And comparing ferry and bus… a ferry from Beach Haven is $7.50, while the bus is $3.15. Not much difference on journey time. Taking the ferry is a bit of a luxury – especially with the minimal service that’s offered. Yep, I live in Birkehead Pt. The Ferry is indeed a lovely way to travel soI don’t mind paying a bit more, but it seems a lot of people in the neighbourhood do take the bus. Can’t be easy. We often start catching the ferry to work (as the ferry terminal is down the bottom of a very steep hill) but I’d like to Uber home (as can get off at Stafford Rd offramp and I’m almost home from there..plus i dont leave work according to a timetable). Unfortunatley that means the monthly pass does’t stack up. No ability to share passes, eg a couple of family pass? that’d be swell. I ponder what life would be like if the harbour bridge had a T2 or T3 lane (or, if more onramps had T2 lanes). Then all the rideshare services would have a further advantage.